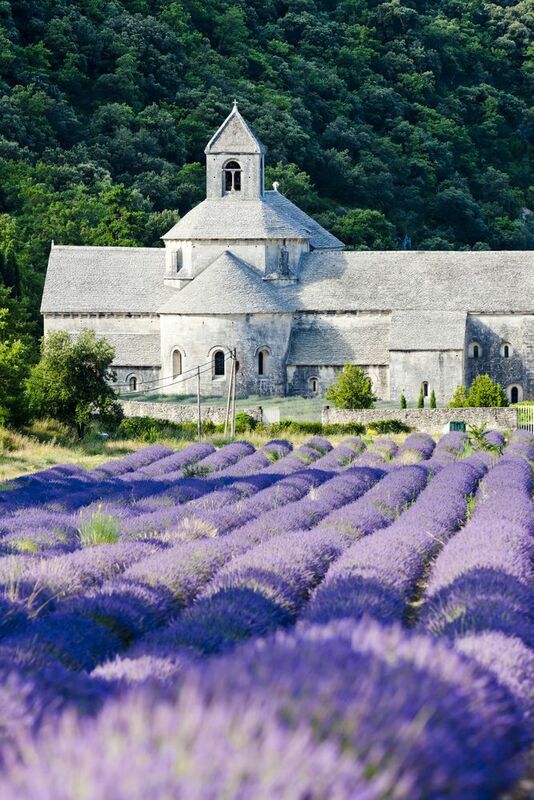 In Provence during the early summer months the fragrance of Lavender is ever present. 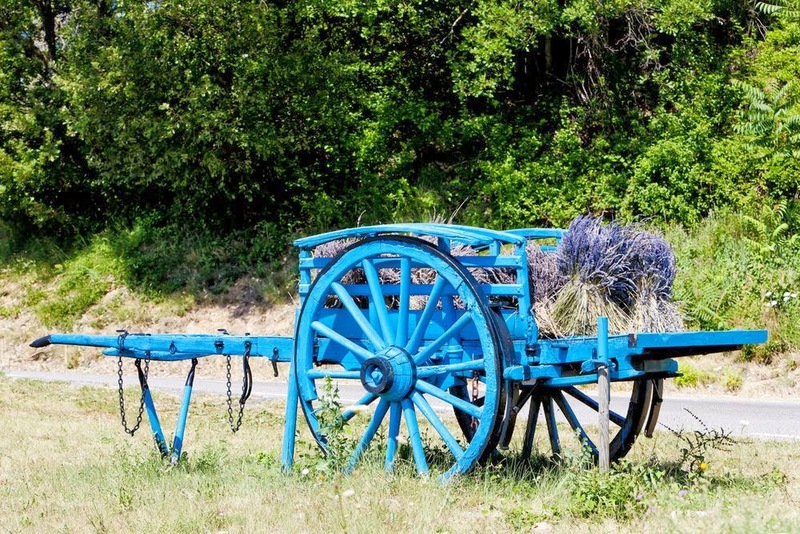 From Spring when the new growth pops out to mid-July/August when the harvest takes place, it’s unmistakable along Provence’s Lavender route. 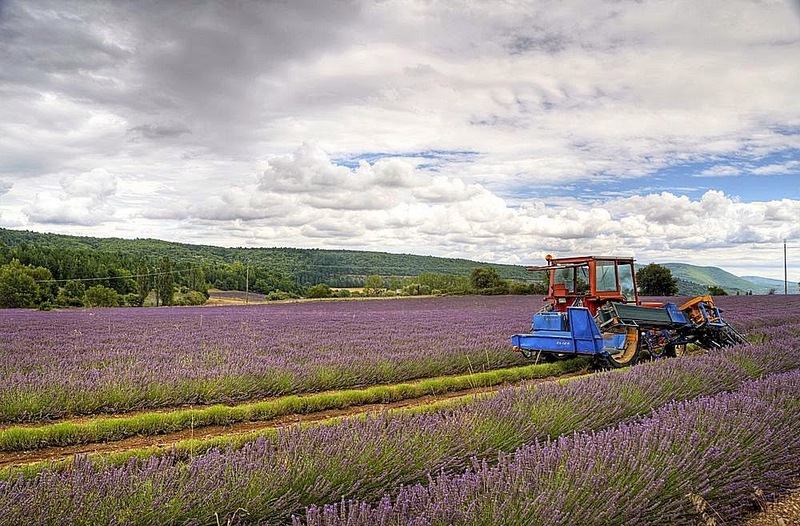 The sight of Provence’s lavender fields in bloom, is quite breath taking – hundreds and hundreds of carefully manicured plants covered with light purple blooms, growing in endless, softly rounded rows, like a large lavender cloud. If you have the opportunity to walk amongst the rows of plants letting your hands gently touch the tops of the flower spikes, the aroma released by the plants is wonderful. 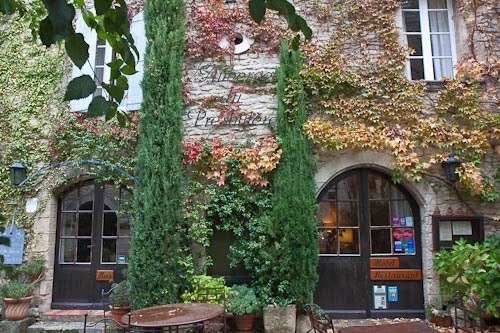 Beginning in Sablet, about two hours of driving will take you through some of the prettiest and sweetest smelling countryside in Provence – passing through historic sites, beautiful towns and postcard scenery. 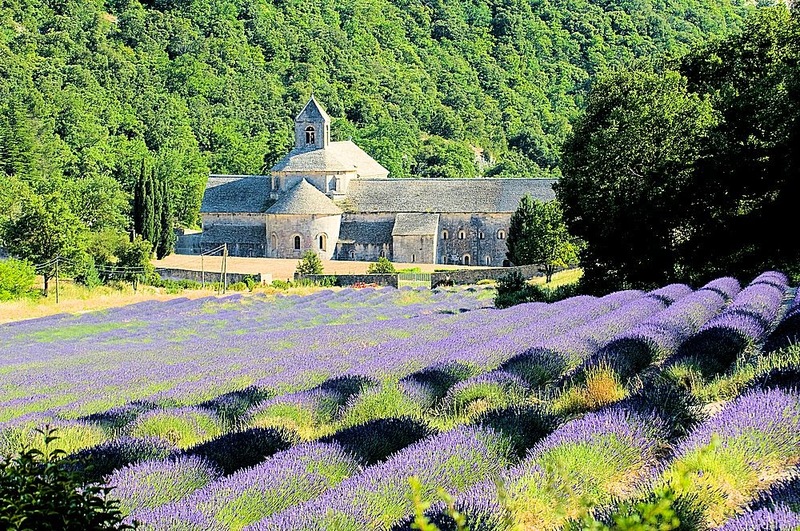 What better place for the first stop in our visit to Lavender country, than at the Abbaye Notre Dame de Senanque – a Cistercian Monastery surrounded by a sea of purple lavender fields. The first hour from Sablet via the D7, D4 and D177 takes us through vineyards, orchards, interesting towns – and perched hilltop villages with unusual features like the “bories” near the village of Gordes. Descending along the winding country road from that picturesque village along the, you can feel the calm and tranquility of this place. Prefer to hike in? 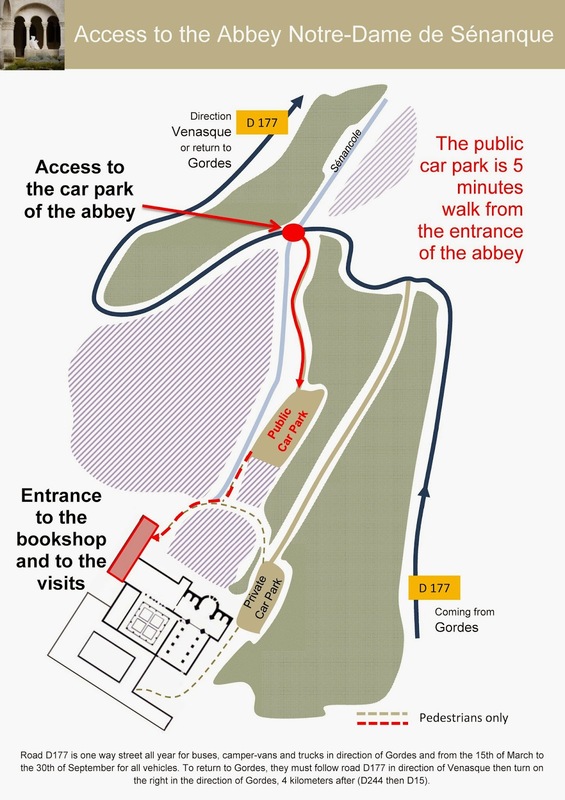 There is also a walking trail from Gordes – but make sure you have good directions as the Abbaye is tucked into a corner between hills. 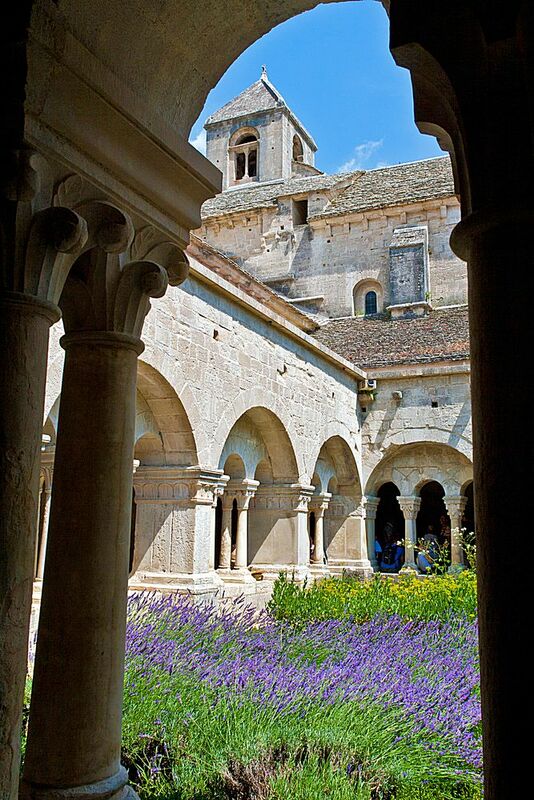 Driving up, the large Romenesque Abbaye, cloister, dormitory and chapter house appear to float on a cloud of lavender. Founded in the 12th Century with the support and concurrence of the Bishop of Cavaillon and Raymond Berenger II, the Count of Provence, the Abbaye saw success and expansion until the14th Century. It had reached a high point with the ownership and development of the Church and adjacent buildings, large farming estates and several mills. By the early fifteen hundreds however, it’s influence and occupancy had declined to a point when, during the Religious Wars from 1568 – 92, it became a prime target of the Hugenots, who ransacked the Abbaye of valuables and destroyed the living quarters. But .. worse was to come for the monks … Two centuries later, during the French Revolution, the lands were nationalized and became the property to the Republique Francaise, as happened with all Churches already built in France at that time. 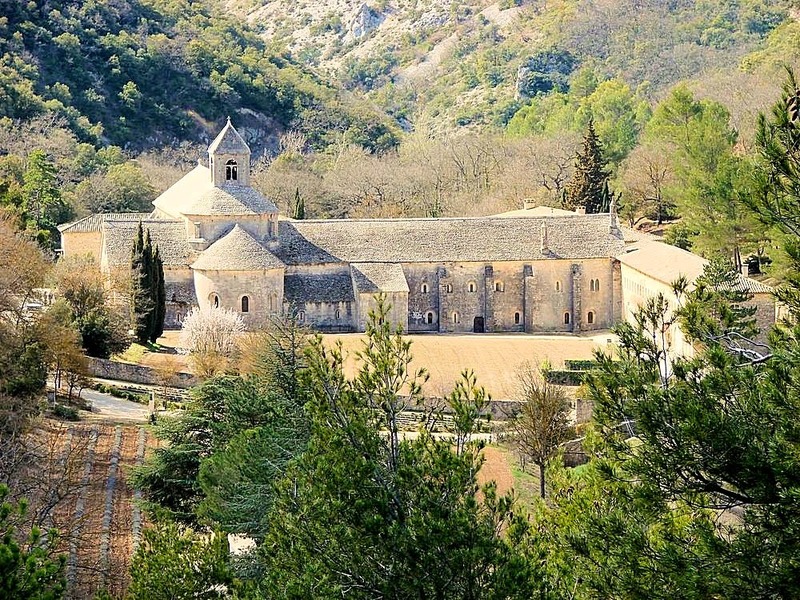 The Abbaye itself was then sold to a private citizen and any remaining monks were evicted. In the late 19th Century, it was purchased by yet another group of Cistercian monks, but their occupancy was rather short lived and they were expelled in 1093. Today’s occupants are a part of a small community of Monks who returned to the Abbaye in 1988 to carry on the lifestyle and traditions of the Order. They support themselves and the Abbaye, by growing the lavender that has become such a notable part of the narrow valley, and by producing lavender honey and other items which can be purchased at the Gift Boutique. It is open to visitors (on a schedule) and still is open to the public for Mass. 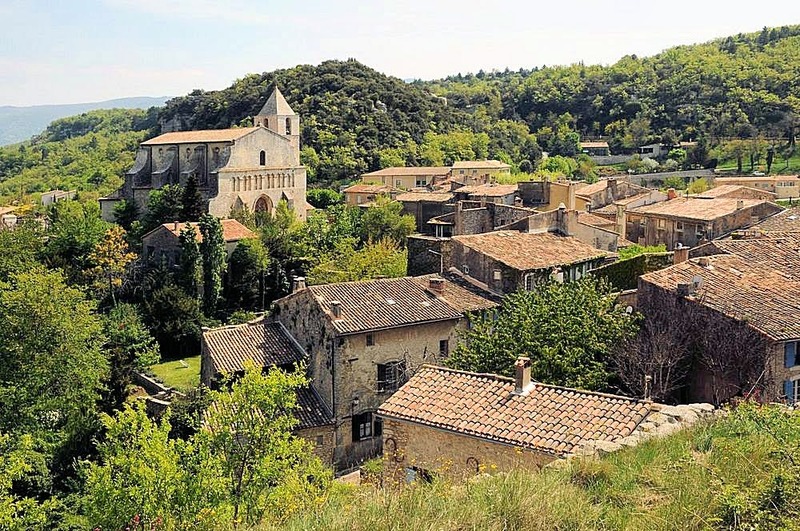 … From the Abbaye, a drive through lavender fields along the D2, D4, D900 and D48 takes you to the serene village of Saignon which is built on a ridge of towering rocks that provided a natural barrier against invaders in times gone by. 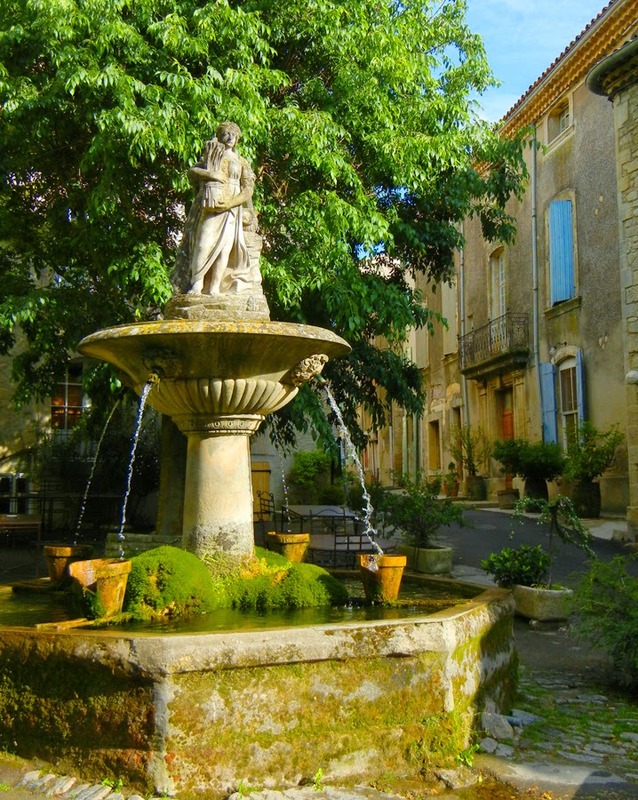 A petit, though very charming village, it was Saignon’s physical location which, as is true with all good real estate, gave it a distinct advantage. Served as a lookout point for invaders – its church bells sounded the alarm to surrounding areas, if the valley was threatened. Although this village had been inhabited and used as a look out point since mid- Palaeolithic times, some 35,000 years ago it grew in significance during the Medieval era. Within the village, three castles were built by three different lords! This together with the imposing 12th & 14th Century Romanesque Church of Notre Dame are quite remarkable for a village of this size. Its importance was well recognized, as the presence of these early buildings indicates. 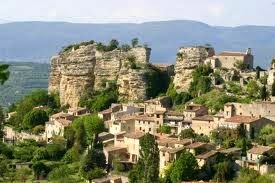 Today, exploring Saignon on foot, we can enjoy the vestiges of the village’s wealth during times gone by. A fountain in the central village square, designed by a sculptor from nearby Apt, Joseph Noel Sollier, carries two statues symbolizing agriculture and abundance that comes from industry. 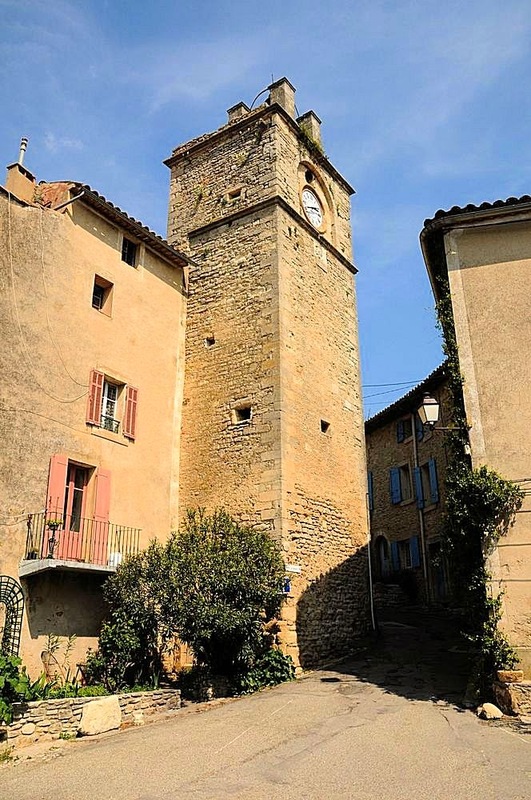 It is surrounded by finely crafted stone buildings, while a about one hundred feet from the fountain, stands a 16th Century Clock Tower and the old Castle Chapel which is built using the same rock on which the village stands – all are monuments to Saignon’s impressive history. Combine milk, lavender and honey in a saucepan and bring to a slow boil. Remove from heat, cover and let steep for approx 5 mins. (at this time, taste the mixture to make sure the lavender flavoring is to your liking, but remember you will be adding eggs and more cream, so balance the flavors but don’t let it get too strong). When the desired strength of flavor is reached, strain the milk and discard the lavender. Beat egg yolks and sugar in a bowl until very thick and light in color. Return milk to the stove and bring back to a simmer. Add some of the milk to the egg mixture, whisking well to combine. Repeat until approx half the milk mixture is incorporated and the egg mixture is tempered. Add the egg mixture to the rest of the milk and cook slowly over a low heat, constantly stirring until the mixture is thick enough to coat the back of a spoon. Stir in the heavy cream and remove from heat. Let the mixture cool in the refrigerator and then freeze in an ice cream maker according to the instructions. Place in an airtight container and place in the freezer to take it from a soft to firmer ice cream.